Who said puffy coats are only for humans? You can get a dog version of almost anything these days – parkas, hoodies, sweaters, raincoats, pajamas, bodysuits. You name it, someone sells it. We spent an estimated $72.1 billion on our pets in the United States in 2018, and with that kind of demand comes options. So many options. Unless you have a malamute or a similarly thick-coated dog, your pup will probably need a winter coat or sweater. Whether you want something fashionable or functional, you’ll have no problem finding it. This Pet Guide article highlights a few things to keep in mind as you ponder your purchase. TAVA’s pick: The Weatherbeeta Parka 1200D is a highly rated choice at a middle-of-the-road price. This polyester-lined jacket is warm, waterproof, and even has reflective strips for extra visibility. When adventure beckons, is your dog always by your side? 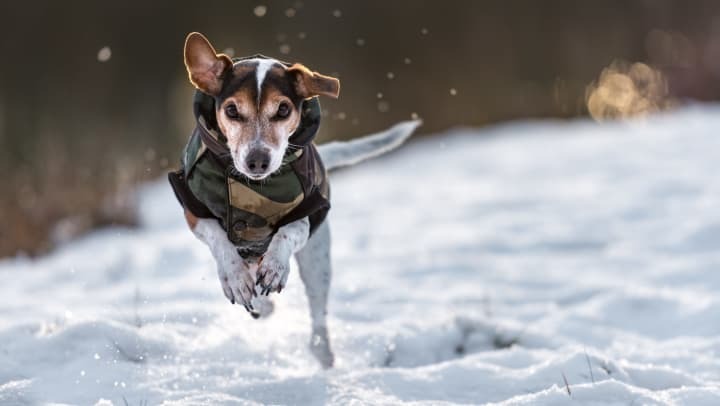 Whether you like to summit peaks on snowshoes or cross-country ski in the backcountry, your pup’s paws need protection if she’s coming along. A pair of rugged, waterproof booties are the way to go. They come in all sorts of colors, sizes, and styles. Look for a waterproof boot that’s textured for good traction. The American Kennel Club offers this primer on dog boots to help narrow down your search. TAVA’s pick: QUMY’s waterproof dog shoes are rugged, highly rated – and, most important, won’t break the bank. Have an outdoor dog? Maybe an older dog with aches and pains? Or maybe you really just want to pamper your pup. Consider a heated dog bed. They come in a variety of materials and sizes, and you can even get an extra rugged one designed specifically for the outdoors. K9 of Mine’s handy guide to heated dog beds breaks down what to watch for as you shop. TAVA’s pick: A quick scan of the internet tells you K&H seems to rule the heated dog bed market. Its Lectro-Soft Outdoor Heated Bed is one of the most highly rated picks on Amazon. It features plush orthopedic foam and is thermostatically controlled. If you’re looking for an indoor option, K&H’s Thermo-Snuggly Sleeper Heated Pet Bed is a warm and pillowy option that’s perfect for dogs with aching muscles or joints. For more life hacks and ideas for winter fun in the Rockies, check out the TAVA Waters blog.